Impatiens are shade tolerant annual or evergreen perennial, and with colourful flowers impatiens make a great addition to any shady corner. 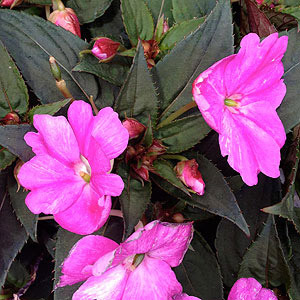 Impatiens require a humus rich soil to perform best. New Guinea Lizzi impatiens include the species Impatiens hawkeri, and this is the species that has been highly hybridised, see picture right. 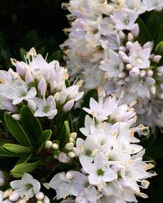 These are prolific flowerers and often referred to as Busy Lizzies, an excellent choice for a window box or a container on a patio.. Some impatiens are fairly low growing reaching around .3m in height, if planted in the border they do need to b towards the front. 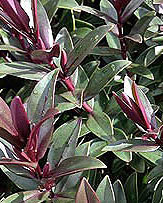 The New Guinea cultivars are taller. 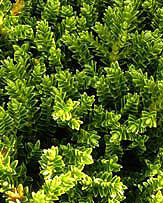 Grown in mass plantings as bedding plants they are also well suited to growing in containers indoors or on a patio. They do require a moist humus rich but free draining soil. 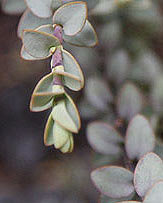 Propagation is from seed or from softwood cuttings. Includes: New Guinea Lizzi impatiens. Young plants specialists. Growing Fuchsias, Geraniums, Patio Plants and Plug Plants. One of the best selections available in the UK direct from the grower!